Flies! Horrible biting flies, out in the middle of the Chesapeake! Out came the fly swatter, and I became a fly hunter on an waterborne safari. Once the flies had been vanquished, we came upon a fleet of cargo ships all anchored and empty, just to the SE of the Bay Bridge and Annapolis. Large, silent giants all out down the bay, and to the distant ocean. It was a strange and mysterious sight. We came upon a quieter Annapolis than the one we’d seen in October. The boat show was no longer in town, and the harbor, though still dotted with sailboats, was not full to the brim with them as it had been in the fall. 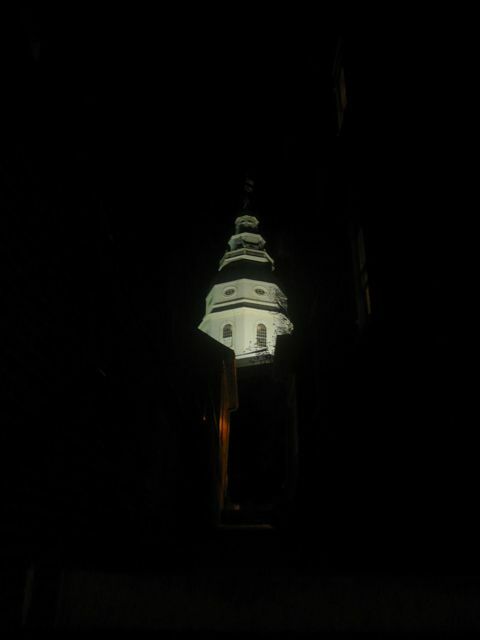 The sight of Maryland’s capitol from the bay still filled me excitement. 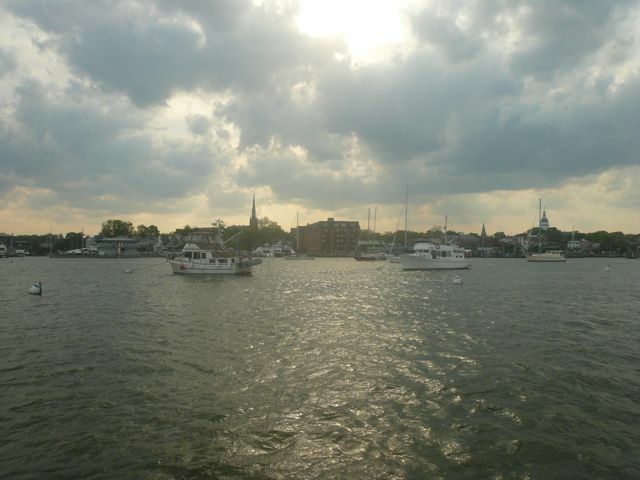 There is something grand and old world about the Annapolis skyline over the water. I love that this is a State capitol that has not been taken over by skyscrapers and high-rises. 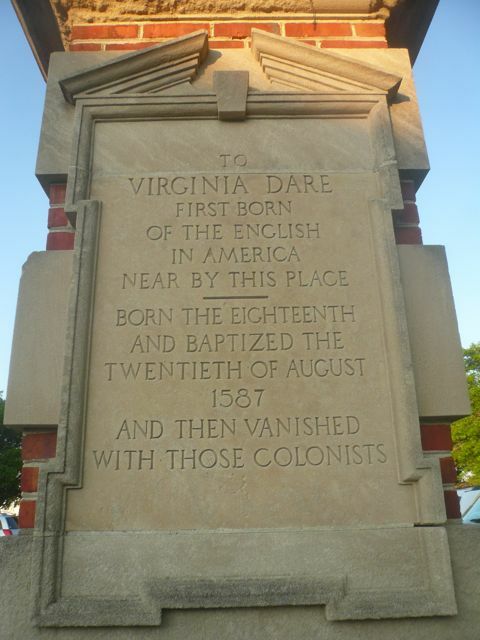 When I walk the streets I can still feel the spirits of the early colonists who walked the city themselves. Kris and I strolled about town often, usually without any destination in mind. There are clothing shops, gift shops, book stores, a comic book store, tea shops, candy shops, ice-cream shops, coffee shops, art galleries, and assorted restaurants all across downtown. Some of our favorites include Chick & Ruth’s, Mangia’s Italian Bar and Grill (best slices of pizza in town), Pusser’s, and City Dock Coffee. Spinnaker prefers blueberry scones from City Dock, and peanut butter treats from Paws, the city pet store. 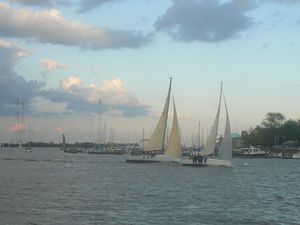 On Wednesday, the previous day’s rain had cleared enough by evening for the weekly Wednesday sailing races. The racers came flying around the corner and slid into the side of the mooring field, sailing to the Spa Creek bridge for the last leg of their race. It was an amazing sight, all of those mylar sails stiff in the wind, hulls healing over for maximum speed, slipping into the waters between the docks and the moored boats. I stood on the deck, memorized by their grace and dexterity. I could not tear my eyes away until the last boat glided past the mooring field. 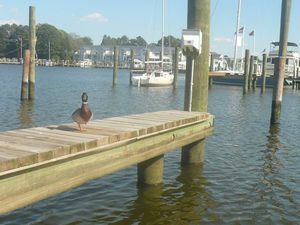 Duck on the St. Michaels marina dock. Quack! and I enjoyed walking around the boats at night, their large hulls looming above me. 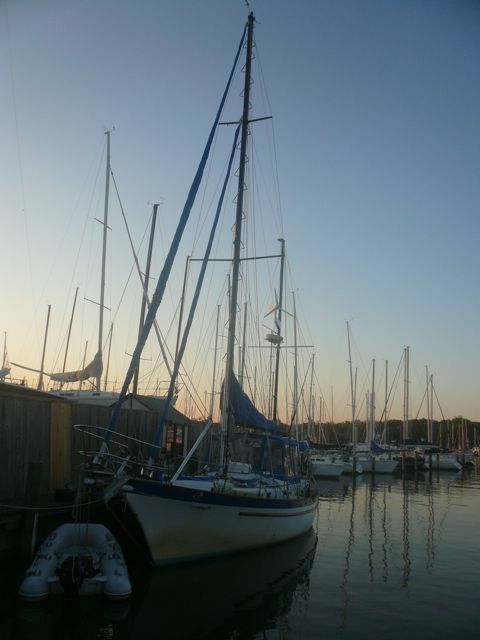 It is erie to see boats from the point of view that a fish must see them in the water. On Thursday we visited Kent Island. Carol and Gary were eager to lunch at their favorite restaurant over the Bay Bridge, the Stevensville Crab Shack. 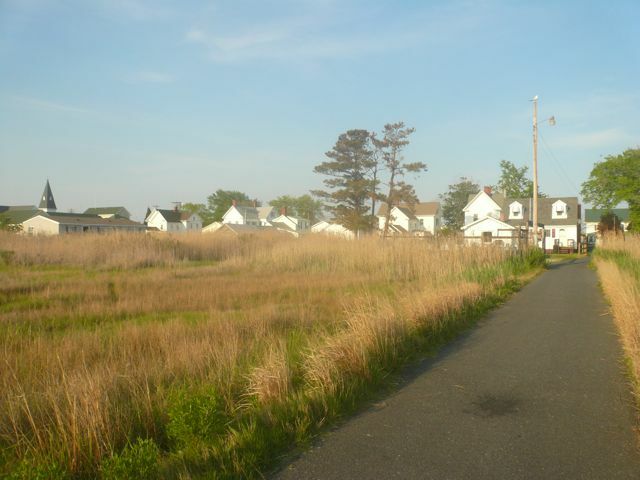 After they feasted on crab, we all headed over to St. Michaels for a stroll about the small Maryland town, were there were a few more gift shops, an ice-cream parlor, and a quiet little marina. On our last evening in Annapolis, Kris and I took a ride around Back Creek to look at the local docked boats. 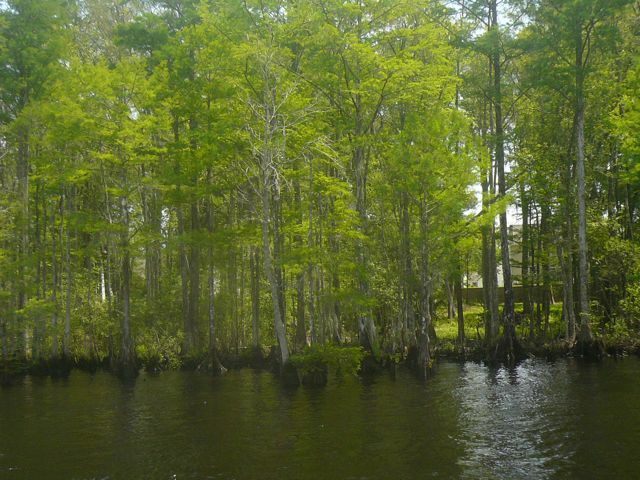 The waters were still and the air smelled wet with deep smalls of teak, moss, oil, and briny bay water. That night we took one last walk around the city with Spinny. The streets were cloaked in a black velvet dress, lit warmly by the street and shop lights. It was a lovely night indeed. Horizons at the dock in Edgewood. I am sad to be leaving the boat for the reality of bills and work, but I will always keep the memories of the amazing places I’ve seen and experienced while onboard Horizons. Hopefully I will be able to take another long adventure with her crew sometime in the near future. I wish them all well on their trip back to Sandusky, Ohio as they re-trace the route we took in the fall. They will most likely be pulling into Battery Park by the end of the month. Until then, I’ll be back home, dreaming of all the new horizons that await Kris, Gary, Carol, and Spinnaker on the last leg of their journey. A large shell of a ship, wrecked for Naval target practice. A tug pushing several barges full of various gravels. Flies! a slew of evil biting flies appeared out of no where in the middle of the Chesapeake! The fleet of cargo ships in the distance. A flock of smaller sailboats racing just out of the harbor. A brilliant sun shines over our destination. A Naval student strolls through downtown. The New England style townhouses. This is for my friend Chris, who loves BMWs. The State House at twilight. Driving by Pusser’s in the evening. The oddly straight line of clouds receding from the city, reveling a baby blue sky. “The Pride of Baltimore” tall ship. Ships, seagulls, and a blue sky beyond. Sailboats come into the harbor on the last leg of the Wednesday evening race. A racer just beyond the mooring field. Healing for that last bit of speed. Some of the racers at the docks at Back Creek. A beautiful pilothouse sailboat in a city ship yard. A shiny little tug-inspired troller. 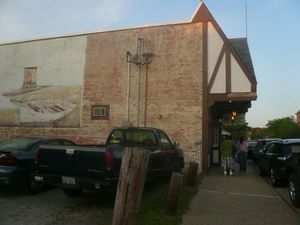 Stevensville Crab Shack, one of Gary and Carol’s favorite places to eat over on Kent Island, MD. Christ Church in St. Michaels, founded in 1672. A small shop in the middle of taller town homes. Up Back Creek. 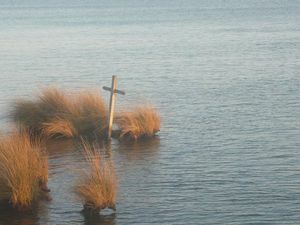 The waters are laced with docks and boats. 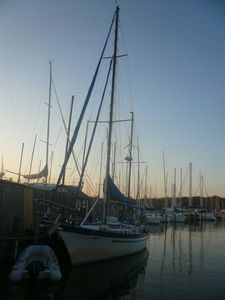 Older model of a Gemini catamaran. New Geminis, all lined up in a neat row. Out for a sunset sail. Kris, Spinny, and the State House by night. Hello everyone! Sorry I haven’t gotten a chance to blog further about our adventures yet. Kris, Carol, and I are currently back in Ohio. Carol and Kris have business to tend to at Cheers and I unfortunately need to start getting back into the swing of things in the real world. Gary and Spinny are with the boat in Annapolis, relaxing and working on boat maintenance. I will blog about our adventures from May 3rd to the 5th as soon as I can. Right now many of my friends back home are all graduating and between all of the celebrations and visiting I have just enough time to type this little message to you all. Look for posts on May 3-5 soon! Then, sadly, I will be signing off, as I will be staying here in Ohio. Let’s hope this rain stops soon! 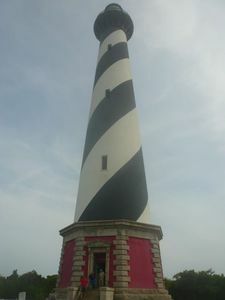 Here a few more photos of our stay by the Outer Banks. One of my favorite places on the Outer Banks was the Cape Hatteras lighthouse. This historic light house still sends out a guiding beam to sailors at sea. However, it is not in the spot it stood in for decades. 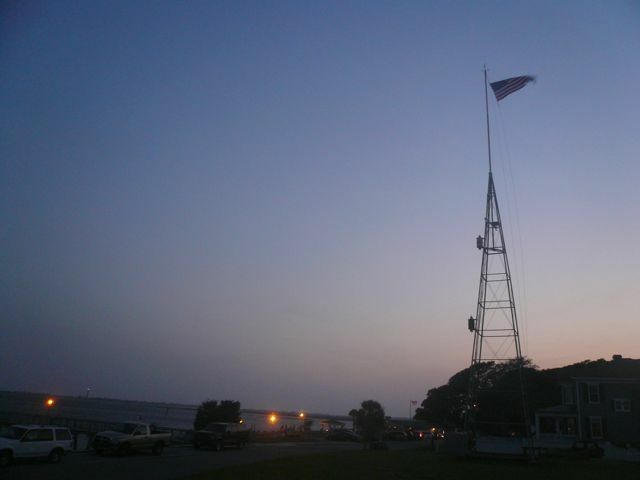 The shoreline was slowly creeping up on the lighthouse, and in the 1990s, it was decided that the structure should be relocated. They moved the entire tower, in one piece, 23 miles inland on a rail and cart system. It stands at the equivalent hight of a 12 story building. However, we weren’t able to climb to the top as the high winds at the time were too strong to allow for visitors to climb the tower. It was still a beautiful sight from the ground. View up the stairs in the lighthouse. A sand bar revealed at low tide. Another Outer Banks lighthouse in the distance. Dock out into the sound. Horizons at the marina in Manteo. Tall ship coming into Roanoke. From Southport we traveled ever northwards to the Outer Banks. After traveling for nearly 24 hours, we stopped in Ocracoke to rest up for the following day’s travels. Ocracoke is a nice little place to stay for a night. A town based chiefly on tourism in the vacationing season, it is filled with boat, bike, scooter, and golf cart rentals, restaurants, fudge and ice cream shops, gift shops, and a small but well stocked grocery store. Kris jumping off Jockey's Ridge with his Power Kite. 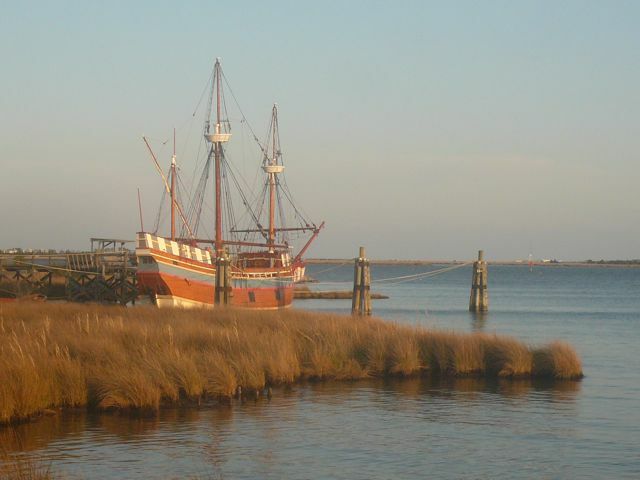 In the morning we traveled further up to Roanoke Island. Pop up scattered storms brewed out on the Pamlico Sound as we traveled, but we made it safely into the marina in Manteo, NC. We’ve been here for the past few days. The first evening here Kris and I went to see The Adjustment Bureau at Ye Old Pioneer Theater in town. Kris and Gary picked up a rental car yesterday and we’ve been exploring the banks. 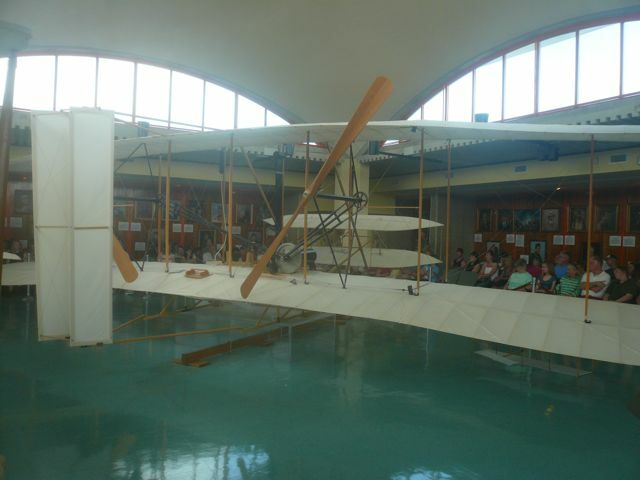 We’ve seen Jockey’s Ridge, Kitty Hawk and the Wright Brother’s Museum, the Cape Hatteras Lighthouse and more. Tomorrow Kris is going to take a 6 hour kite boarding class. He was inspired by the crazy kite boarders who were out on the water in 30-40mph winds today. They were soaring off the water and 15ft in the air! Here are a few photos of our adventures thus far. More details to come later! This pizza shop was not open, but Kris liked the sign. Ocracoke. The lighthouse is in the center. The storms brew behind us. A home in Manteo with azaleas a-bloom. 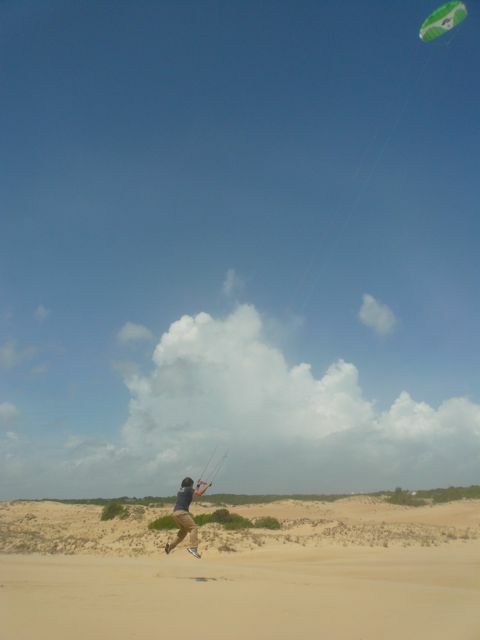 Kris jumping off Jockey’s Ridge with his Power Kite. A replica of the Wright Brothers’ motor flier. 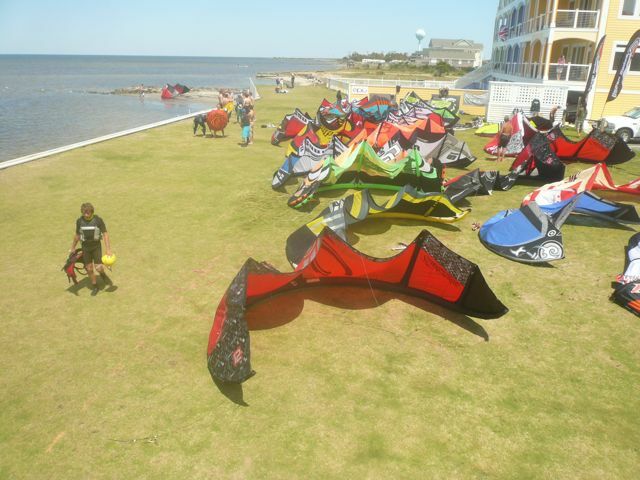 Kite boarders off the beach. From Georgetown we traveled up the ICW toward Little River, NC. 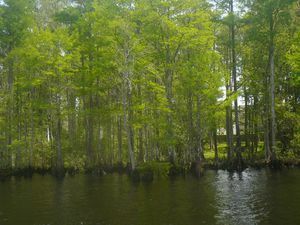 The stretch of the ICW that we passed through was bordered by a beautiful cyprus swamp. Ospreys nested in the tall trees on out on the channel markers. I posted a few photos of these fishing hawks in a previous post: Down the Intracoastal in South Carolina We traveled more quickly than anticipated and made it to our planned anchorage too early. The tide was down and the entrance too shallow. With several hours of daylight to go, we headed for what appeared to be another good anchorage. Once we got there though, the current was ripping through the little river inlet and neither anchor was holding. Luckily for us there was a restaurant was dockage on the river. Kris pulled into the dock magnificently, despite the strong current that pulled him off to the starboard side. Carol and I assisted from the dock, pulling the bow and stern lines to keep Kris from pulling too far to the right and away from the dock. It was an exciting and exhausting night. Range marker and signal flag. The following day we left early to journey up to the Cape Fear area. I’m still not entirely sure why it’s called Cape Fear, but I believe it is because of the numerous shoals in the area, particularly the one that stretches out from the point about 10 miles out into the ocean. Ships unfamiliar with the area would have a hard time safely navigating into the harbor. That is where the town of Southport comes in. For centuries pilot boat captains have been guiding ships through Cape Fear waters and into port. Southport is now a quiet little town, with a few restaurants and shops that do their real business in the vacationing season. The houses around town range from the 19th century to present day. The Southport Marina is a nice place to stay for a few days, with electric, water, showers, laundry, and diesel and gasoline readily available. However, if business is not too booming, you can tie up for free at the Provision Company in town. Docking is limited but the food is quick and good. We stayed in Southport through most of Easter Sunday. At 5pm we headed out on a 24 hour trip up to the Outer Banks. Lighthouse coming into Little River. Beautiful old ketch anchored out near Southport. Southport is filled with old homes, some built as early as the late 19th century. We said our goodbyes to Charleston and headed out into the Atlantic for a 19 trip to Georgetown, SC. Georgetown seemed like a sleepy old historic town. We walked around for a bit, but nearly everything was closed as we’d arrived at about 6:30pm. Here are a few photos of the trip and the old town. Fishing boats on the ICW up to Georgetown. One of the only restaurants open in town.